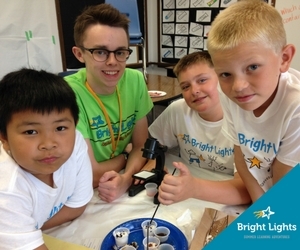 Bright Lights has summer classroom assistant volunteer opportunities available for 9th – 12th grade students, college students and adults. Discover some fun for yourself while providing enrichment for students! Classroom assistants play a valuable role in helping Bright Lights students in grades K-8 discover and pursue their passion in science, the arts, math, music and technology. Volunteer opportunities are available during all five of Bright Lights program weeks: June 5-9, June 12-16, June 19-23, June 26-30 and July 10-14. Bright Lights main class site for Summer 2017 is once again Holmes Elementary, located at 52nd and Sumner streets in Lincoln, NE. Additional classes are held at other community sites. For those interested in an international experience, apply to be an assistant at Lux Middle School the week of June 19-23 when students from Japan join American students. The hours earned as a classroom assistant can fulfill high school volunteer requirements, such as those needed for Government and Politics class. Students receive 20 volunteer hours for assisting with a half-day class for one week, attending an orientation and helping with set-up day. Over 250 assistants are needed to work with Bright Lights teachers in our hands-on classrooms. No prior Bright Lights or teaching experience is necessary—but if you are a former Bright Lights student you know what kind of fun awaits you! Assistants are instructed during a 90-minute orientation session in May. Bright Lights will accept classroom assistant applications at BrightLights.org/assistants/application beginning March 8. Apply early for the best selection of classes. Browse our class descriptions and schedule for all of the Bright Lights Summer 2017 classes. Student registration for the classes begins April 1. 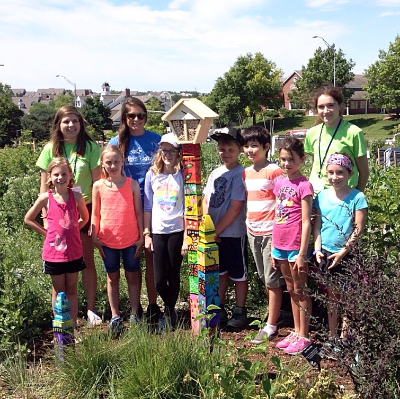 Questions about volunteering may be directed to: 402-420-1115, ext. 49 or classassist@brightlights.org .